Milwaukee, WI—The Milwaukee Admirals announced today that the team has signed 2010 Hobey Baker Memorial Award Winner Blake Geoffrion to an Amateur Try-Out Contract (ATO). The former University of Wisconsin star will look to make his Admirals debut tonight when the Ads travel to Chicago for game two of the West Division Semifinals at 7:30 pm at the All-State Arena. Geoffrion won the award given to college hockey’s most outstanding player after tying for second in the nation in goals (28) and finishing first in Division I hockey in power-play tallies (15). A tri-captain for the Badgers in 2009-10, Geoffrion posted 50 points (28g-22a) in 40 games, helping the school reach the NCAA National Championship Game. The 6-1, 196-pound right wing was both a First Team West All America, and First Team WCHA selection in his senior season, and was named Most Valuable Player of the West Regional after leading UW to victories over Vermont and St. Cloud State with five points (2g-3a) in the two games. During his four-season collegiate career, the Predators first pick in the 2006 NHL Entry Draft amassed 114 points (55g-59a) and 243 penalty minutes in 146 games. His grandfather, Bernie “Boom Boom” Geoffrion and great grandfather, Howie Morenz, are both Hockey Hall-of-Famers who won a combined nine Stanley Cups as members of the Montreal Canadiens. His father, Danny, was drafted eighth overall by the Canadiens in the 1978 Draft, and played for both Montreal and Winnipeg during his career. 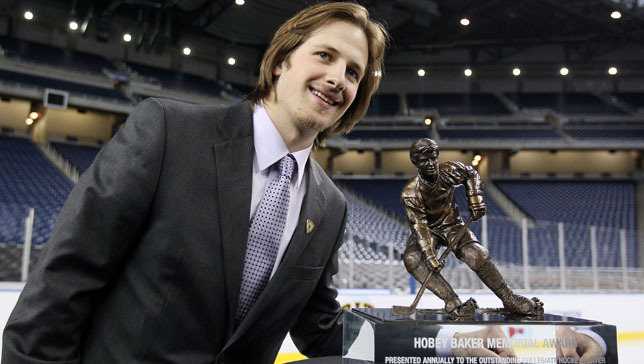 Geoffrion will become the second Hobey Baker winner to play for Milwaukee. Admiral’s legend Tony Hrkac, who won the award with North Dakota in 1987, was the first. The Ads will host games three and four of the series on Saturday, April 17 at 7:00 and Monday, April 19 at 7:00 pm respectively. Fans can buy tickets for these games by calling Ticketmaster at (800) 745-3000 or online at www.ticketmaster.com. Tickets are available for $12 and $10 and groups of ten or more people receive a minimum of $2 off of each ticket. For more information or to order group tickets call the Admirals office at (414) 227-0550. Playoff packages are still available and guarantee the same seat for all potential post-season games. For more information on playoff packages go to www.milwaukeeadmirals.com.